Hello, hello, back again! Here we have the Named Sloan Sweatshirt in Atelier Brunette sweatshirt fabric, which I bought from Faberwood (now sold out but is available in a number of other places too). It's been very popular and with good reason. The fabric is beautifully soft and cosy, with a fuzzy loop back, but it's quite lightweight and drapey for a sweatshirt fabric. And it's so pretty! In short, it's beautiful and very cosy to wear. Buy some. I have been fancying another sweatshirt pattern for a while. I had a vision of a black "sports luxe" inspired sweatshirt to wear to work with skirts, and I wanted it to have normal set in sleeves, rather than the raglan of the Linden. I love the Linden, but it is altogether more relaxed. I had looked at a number of different patterns, including the Sloane, but always discounted it due to the darts. I didn't really "get" darts in a sweatshirt. But something made me go back and look and I ended up buying the pattern in their Valentine's Day sale. I'm glad I did. It's exactly what I was looking for. I'm still not sure I understand the need for darts, but they are fairly inconspicuous and inoffensive and I guess if nothing else, they add a point of difference. As with my previous experience of Named, the pattern is well drafted and the instructions concise but thorough. It went together easily with the exception of the cuff and waistbands. The bands are quite a bit smaller than the sleeves/bodice to give that slouchy bloused look, but I found them difficult to set in. Bands are never my favourite thing to do anyway, but these were tricky. I ended up actually gathering the sleeves into the wrist bands, and still ended up with a couple of puckers, which I am doing my best to ignore. The fabric had a tendency to curl at the cut edges, which also made the bands difficult to attach. I always think you need at least one more pair of hands when setting in bands, since you need to hold the fabric in several places. To counter that, I did a few things. Firstly, I basted the cut/open edges of the band together so they wouldn't shift. Secondly, I basted the bands in before finally sewing with a lightening stitch. I haven't actually removed any of the basting stitches, but I will do, if come to feel feel it's necessary. Not a great photo, but you can see the darts nicely here. I cut the size 38, based on my measurements. I did consider sizing down, and the finished garment measurements indicate that I could probably have got away with it. I did baste the bodice together to try for size before committing to the zigzag stitch. I am late to the baste-fitting game, but for some stuff, it works well. Construction-wise, I read through the instructions once, then ignored them. It's pretty straightfoward. They suggested using clear elastic in the shoulder seams, but I didn' have any so used black grosgrain ribbon instead. It's a little bulky but it will do the job. Shock horror! I accidentally sewed some of this with a straight stitch, at 2.5 length no less! I didn't realise that I had forgotten to switch to lightening bolt - well, I had switched, but then I switched back and forgot I'd done that. Luckily, it's only the shoulder, side and sleeve seams, which don't need to be able to stretch much. I noticed before I got to the bands. Some of this has raw edges because I am lazy, but then perfectionism won over laziness when it came to the neckband and so I dug out the overlocker, changed the threads to (mostly) matching ones and overlocked all the seams of the bands. It does look much better when I don't have it on, which, of course is always an important consideration! I'm not sure there is much more to say on this. I love it, it's comfy and wearable and snuggly and cool. This is not the sweatshirt for work though - our office is way too hot for this fabric - but it's perfect worn casually, with jeans, or like here with my Moss skirt (with star print Lark underneath for good measure!). I'm back again with another RTW inspired garment. I'll soon be known as the plagiarism Queen! I stumbled on this jumper on the Whistles website recently and was intrigued by the description of Stepped Hem Knit. The pictures aren't that clear, but with a bit of zooming in, I was able to make out the stepped hem detail at the side. 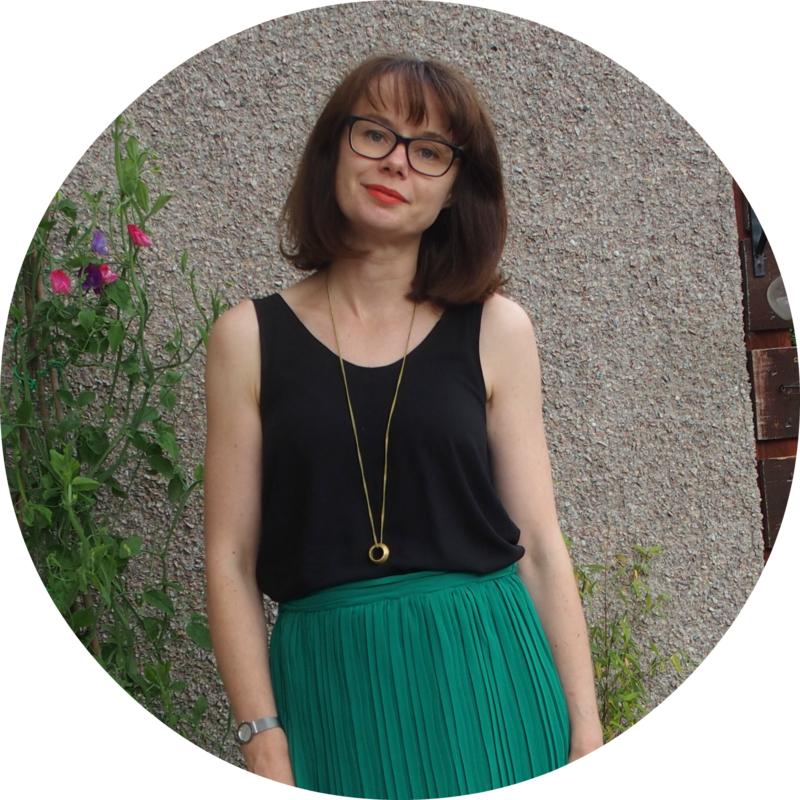 I happened to have a similar stripe knit in the stash that I had already planned to make into another Lark Tee, so I decided to have a go at copying the hem. It's hard to see in the photo but if you can zoom in a bit, you'll see that there is actually a triangular shaped insert where the side seam should be, which is another detail I wanted to replicate. Straightened out the side seams, to remove the waist shaping. Removed seam allowance from the side seams. Butted the front and back pattern pieces up against each other at the side seam. Drew a triangle, which I then traced. Decided what length I wanted to make the front and back and also the stepped bit (i.e. the triangle). Added seam allowance back on. It came together pretty much as planned. I noticed a couple of "drafting" errors as I sewed it up, such as I forgot to take the SA off the armscye, so I don't have a nice point to my triangular insert underneath the arm. Hack and learn. Here is a photo which makes me look like a tube with no limbs, but shows the insert quite well. I raised the neckline by 1/2" after finding it too low last time. I like this and might even raise it by a further 1/4" next time, as I really like how it sat before I sewed the neckline. I accidentally sewed the whole thing using a 1/2" SA, instead of the given 3/8", but it hasn't had any negative impact. The sleeves are a little tighter than I was expecting, but I've managed to get away with it. The fabric stretches out a little with wear, so it's perfectly comfortable. There is still something going on with the armscye on this pattern. I think it's too long/low for me. It looked fine on my star print version, but with this and my first (unblogged) version, it doesn't look right. I might play around with reducing this slightly in my next Lark, as it's stopping this from being my perfect tee pattern. It was all sewn on my sewing machine with a lightening bolt stitch, although I did baste all 4 side seams first to help with the stripe matching. It's not perfect, but it's liveable with. My sleeve stripes are slightly misaligned (i.e. the sleeves are not perfectly symmetrical), but I'm coping. I didn't finish the raw edges and hems and neckline are done with a triple stitch. I like the look of the twin needle, but I find that the threads quite often break. The triple stitch seems to be sturdier, albeit less pretty. The fabric is from The Village Haberdashery and is the Interlock Stripe by C. Pauli in India Ink and Cloud Blue. It's currently out of stock, but they have lots of other colours in both stripes and solids. It's 100% organic cotton, so doesn't have any recovery but it's lovely and soft, nice to both wear and sew. I have used it previously for this t-shirt. I am almightily pleased with this. It worked as I had envisioned. The stepped hem isn't too dramatic, and it might be nice to do a more exaggerated version at some point, but it's a nice detail. 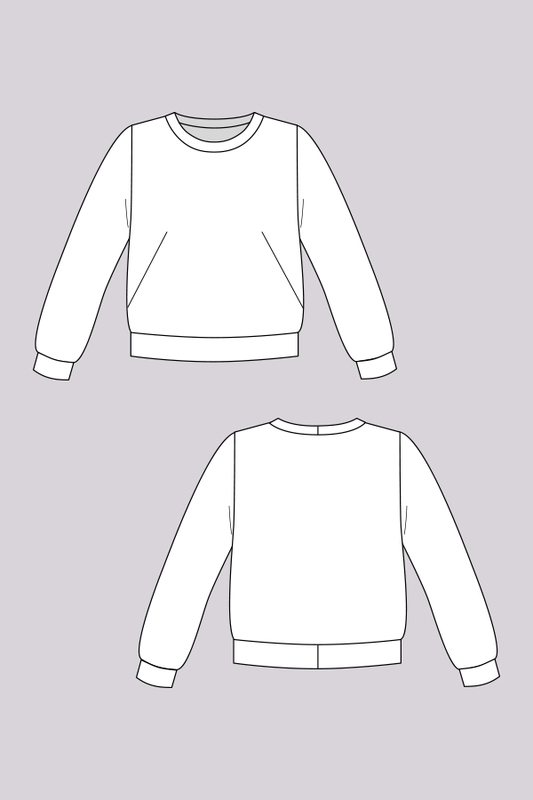 I also really like the idea of a sweatshirt version and in a brighter colour (either in tee or sweatshirt format), the step hem would be more obvious. To prove that I really do like this, here is a photo where I am actually smiling, albeit very goofily!